Map of the Areas. Red line: a projection of the route of the West Bank Barrier (20 February 2005). The Oslo II Accord divided the Israeli-occupied West Bank into three administrative divisions: Areas A, B and C. The distinct areas were given different statuses, according to their governance pending a final status accord: Area A is exclusively administered by the Palestinian Authority; Area B is administered by both the Palestinian Authority and Israel; and Area C, which contains the Israeli settlements, is administered by Israel. Areas A and B were chosen in such a way as to just contain Palestinians, by drawing lines around Palestinian population centers at the time the Agreement was signed; all areas surrounding Areas A and B were defined as Area C.
Area A comprises approximately 18% of the West Bank and Area B about 22%, together home to some 2.8 million Palestinians. As of 2015, Area C is home to 150,000 Palestinians in 532 residential areas. It is also home to 389,250 Israelis, in 135 settlements, as well as 100 outposts unrecognized by the Israeli government. Area C forms a contiguous territory, administered via the Judea and Samaria Area administration. In contrast, under the Oslo Accords Areas A and B were subdivided into 165 separate units of land that have no territorial contiguity. "Land in populated areas (Areas A and B), including government and Al Waqf land, will come under the jurisdiction of the Council during the first phase of redeployment." The populated areas were defined by delineations on a map attached to the document. Area C comprised the areas of the West Bank outside Areas A and B.
Redeployment of the City of Hebron. 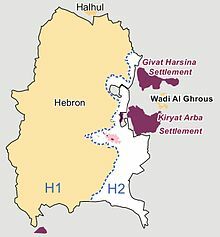 H1 makes up as Area A and H2 makes up Area C.
Area A (full civil and security control by the Palestinian Authority): initially, circa 3% of the West Bank, exclusive East Jerusalem (first phase, 1995). As of 2013, Area A formally comprised about 18% of the West Bank. The Israel Defense Forces abolished the prohibition against entering Area A during Operation Defensive Shield in 2002 and enters the area regularly, mostly at night, to conduct raids to arrest suspected militants. Typically, such raids are coordinated with the Palestinian security forces. This area includes eight Palestinian cities and their surrounding areas (Nablus, Jenin, Tulkarem, Qalqilya, Ramallah, Bethlehem, Jericho and 80 percent of Hebron), with no Israeli settlements. Entry into this area is forbidden to all Israeli citizens. Area B (Palestinian civil control and joint Israeli-Palestinian security control): initially, circa 23–25% (first phase, 1995). 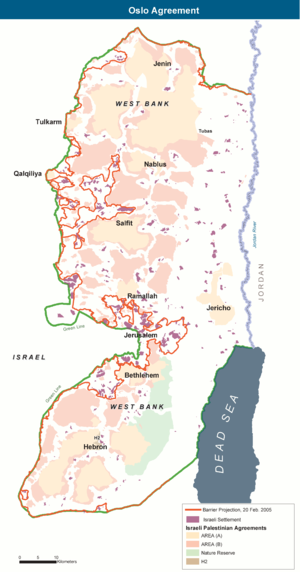 As of 2013, Area B formally comprised about 22% of the West Bank. This area includes some 440 Palestinian villages and their surrounding lands, and no Israeli settlements. Area C with Israeli settlements and Israeli military checkpoints, where the access is closed and restricted to Palestinians. Area C (full Israeli civil and security control): initially, circa 72–74% (first phase, 1995). Under the 1998 Wye River Memorandum, Israel would further withdraw from some additional 13% from Area C to Area B, which officially reduced Area C to circa 61% of the West Bank. Israel, however, withdrew from only 2%, and during Operation Defensive Shield, it reoccupied all territory. As of 2013, Area C formally comprised about 63% of the West Bank, including settlements, outposts and declared "state land". Including or excluding annexed East Jerusalem, no-man's land and the Palestinian part of the Dead Sea also determines the percentage. John Kerry, U.S. Secretary of State stated that Area C "is effectively restricted for any Palestinian development, and that in 2014, his office had noted only one building permit had been granted to Palestinian residents of the area. All Israeli settlements, including those in and around East Jerusalem, are located in Area C. Oslo II, Article XII, for example, states: "For the purpose of this Agreement, 'the Settlements' means, in the West Bank the settlements in Area C; and in the Gaza Strip ..."
In 1972, there were 1,000 Israeli settlers living in what is now Area C. By 1993, their population had increased to 110,000. 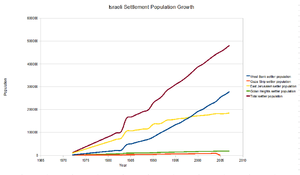 As of 2013, an estimated 350,000 Jewish settlers lived in Area C in Israeli settlements and outposts. In 2013, some 300,000 Palestinians lived in Area C, scattered over 532 residential locations. ″"Area C" means areas of the West Bank outside Areas A and B, which, except for the issues that will be negotiated in the permanent status negotiations, will be gradually transferred to Palestinian jurisdiction in accordance with this Agreement″. The issues that will be negotiated, according to Article XVII, are ″Jerusalem, settlements, specified military locations, Palestinian refugees, borders, foreign relations and Israelis; and … powers and responsibilities not transferred to the Council″. Parts of Area C are military area closed for Palestinians. Part of Area C was intended to be handed to Palestinians by the end of 1999. Israel promised to redeploy its troops from Areas A and B before the elections. After the inauguration of an elected Palestinian parliament, the Israeli Civil Administration would be dissolved and the Israeli military government be withdrawn. The Council would get some powers and responsibilities. ″The Council will assume powers and responsibilities for civil affairs, as well as for public order and internal security, according to this Agreement″. The military forces would be redeployed in "specified military locations" in the West Bank, to be negotiated in the permanent status negotiations within 18 months. The Legislative Council was elected in January 1996. OCHAoPt map of Area C. More than 99% of Area C is heavily restricted or off-limits to Palestinian development, with 68% reserved for Israeli settlements, approximately 21% for closed military zones, and about 9% for nature reserves. Construction permits for residential or economic purposes are, according to World Bank, "virtually impossible" for Palestinians to obtain. Area C, 99% of which is excluded from Palestinian use, contains most of the West Bank’s natural resources and open spaces, access to which, according to the World Bank, would enable the Palestinians to halve their budget deficit and lead to an expansion of their economy by a third. According to Danny Rubinstein: "Much land in Area C is undeveloped. Israel, however, does not permit Palestinian construction for residential, commercial or industrial purposes." 70 percent of the area is defined as within settler municipal boundaries, where permits for development are denied to Palestinians. The World Bank estimates that the effect has been to cause a potential loss of $14 billion of revenue for the Palestinian economy. According to a 2013 EU report, Israeli policies have undermined the Palestinian presence in Area C, with a deterioration in basic services such as water supplies, education and shelter. Nearly 70% of the Palestinian villages are not connected to the water network that serves settlers, which accounts for the fact that Palestinians in the zone use only a quarter to a third of the pro capita consumption of settlers. Palestinians cannot build in Area C without an army permit; however, building applications are expensive and have a 5% approval rate. As a result, most Palestinians who build there do so illegally. Israel demolishes about 200 buildings per year in Area C.
Israel has made over 14,000 demolition orders against Palestinian-owned structures in Area C since 1988. As of January 2015, almost 20% of the demolition orders issued had been executed and more than 11,000 of these still outstanding, affecting an estimated 17,000 structures. Israeli planning in Area C allocates 13 times more space to Israeli settlers than to Palestinians there, according to the United Nations. Israeli settlers have been allocated about 790 square meters per capita, whereas Palestinians have been allocated about 60 square meters per capita. During the period 1988–2014, the Israeli Civil Administration issued 6,948 demolition orders against structures in settlements located in Area C. As of January 2015, 12% of these were classified as executed, 2% were cancelled, another 2% "ready for execution" and 2% on hold due to legal proceedings. More than one-third of the orders were classified as "in process", while the current status of about 45% of the demolition orders against settlement structures was unknown. The relatively new phenomenon of building Palestinian settlements began in 2006, attempting to trace after the Israeli settlement experience beyond the 1967 Green Line, and in a media-driven counter-offensive. The most notable Palestinian settlement in the West Bank, defined by Israel as "illegal", was built in January 2013 on E1 Area East of Jerusalem. The settlement which was named "Bab al-Shams" consisted of about 20 tents, constructed by the Popular Struggle Co-ordination Committee. A few days after the evacuation another "Palestinian settlement" was erected in the village of Beit Iksa near the planned Wall barrier, which they claim would confiscate Palestinian land. It was named "Bab al-Karama". Area B is defined as land under Palestinian civil control and Israeli military control. According to Dror Etkes, Israeli settlers have violated the accords by spreading into Area B and seizing private Palestinian land for cultivation and settlement. Examples he cites are the Amona settlement, overlooking Ofra, where he argues that land belonging to villagers of Deir Dibwan has been taken for redevelopment; the settlement of Itamar which he says has seized control of land and resources belonging to the Area B villages of Yanun, Awarta and Einabus; he states that settlers have seized Area B land near Esh Kodesh and Mitzpeh Ahiya east of Shilo; and he states that settlers of Ma'ale Rehav'am have built in a nature reserve established under the Wye River Memorandum. Responsibility for religious sites in the West Bank and Gaza Strip was to be transferred to the Palestinian side, gradually in the case of Area C. The Palestinian side agreed to ensure free access to a specific list of Jewish religious sites but due to the uncertain security situation the Israel Defense Forces limits visits by Jews to rare occasions. In Area C, Nabi Musa was to be under the auspices of the Palestinian side and access to al-Maghtas on the Jordan River was promised for particular religious events. ^ "Estimated Population in the Palestinian Territory Mid-Year by Governorate,1997-2016". Palestinian Central Bureau of Statistics. State of Palestine. Archived from the original on 8 June 2014. Retrieved 8 June 2014. ^ Hass, Amira (2012-01-12). "EU Report: Israel Policy in West Bank Endangers Two-state Solution". Haaretz. Retrieved 2016-06-15. ^ "15,000 More Jews in Judea-Samaria in 2014". Arutz Sheva. Retrieved 2016-06-15. ^ Nahum Barnea, 'Beitunian nights: The IDF in the West Bank,' Ynet 18 March 2016. ^ a b c d The demise of the Oslo process. Joel Beinin, MERIP, 26 March 1999. In area B, consisting of about 23 percent of the territory (including some 440 villages and their surrounding lands), the Palestinians are responsible for certain municipal functions, while joint Israeli-Palestinian patrols maintain internal security. Area C, consisting of about 74 percent of the territory including all of the 145 settlements and the new Jewish neighborhoods in and around East Jerusalem, remains under full Israeli control. ^ MFA, "Map No. 1 – First Phase of Redeployment"
^ New York Times, 23 July 2012, "Israel Seeks Army Use of West Bank Area"
^ 'Kerry: Israel 'imperilling' two-state solution,' Ma'an News Agency 6 December 2015. ^ Diab, Khaled (6 September 2012). "Bedouin kids' school of hard knocks". Haaretz. Retrieved 9 September 2012. ^ Ron Pundak, "Decoding Bibi's West Bank agenda," Haaretz, 3 August 2012. ^ a b "West Bank and Gaza – Area C and the future of the Palestinian economy". World Bank. 2 October 2013. pp. xi, 4. ^ Associated Press, "Palestinians lose billions to Israeli land bans, says World Bank report," The National, October 8, 2013: "Without the ability to conduct purposeful economic activity in Area C, the economic space of the West Bank will remain crowded and stunted, inhabited by people whose daily interactions with the state of Israel are characterised by inconvenience, expense and frustration." ^ a b Danny Rubenstein, "The Palestinian economy: Israel's control over Area C comes at a price". Ynet, 9 February 2015. ^ "Palestinians in West Bank's Area C suffer in limbo," Los Angeles Times, 18 May 2013. ^ "West Bank settlements: Bulldozers at the ready". The Economist. Retrieved 2 August 2015. ^ "Villagers expand first Palestinian settlement". International Solidarity Movement. 8 February 2005. Retrieved 16 January 2013. ^ "Palestinian protest on land assigned for E1 settlement". BBC. 11 January 2013. Retrieved 16 January 2013. ^ Zianta, Rana (23 January 2013). "Palestinian village Bab Al Karama demolished". Al Arabiya. Retrieved 5 October 2016. ^ Haaretz, Akiva Eldar, West Bank outposts spreading into Area B, in violation of Oslo Accords. 18 February 2012.